The Fire and Rescue Service in Three Rivers is provided by Hertfordshire Fire and Rescue Service. Many Fire and Rescue Services offer a free home fire safety visit to people living within their fire station boundaries to help identify potential fire risks and provide advice on what to do to reduce or prevent them. They can also help you develop an escape plan in case the worst does ever happen. The home fire safety visits are carried out by operational crews, they are completely free and you may be eligible for a free smoke alarm. You can book a Safe and Well visit with the Fire Service by phoning your local fire and rescue service - details in phone book (not 999), or online at: www.fireservice.co.uk/safety/hfsc. Our advice is to attend an organised bonfire if possible. Bonfires should be built at least 18 metres from any buildings, trees, fences etc. They should be no more than 3 metres high for private events and should not be built under overhead cables. Do not use petrol or any other flammable liquid to start a bonfire. Always check inside the bonfire for animals and children who could be using them as a den. Running a display takes a lot of work, so try to share the load by planning ahead. Set up a committee whose members can each take responsibility for a particular task (including one person to be in charge of all safety arrangements). 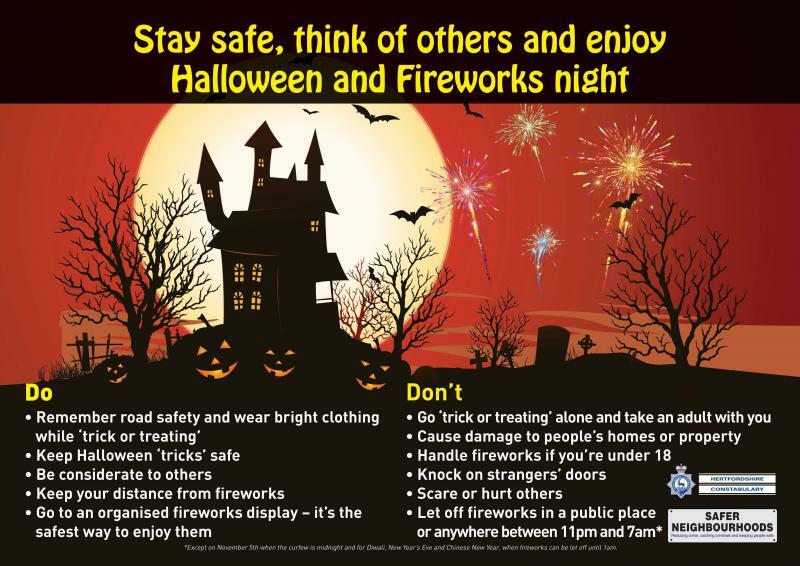 Publicise the fact that spectators are not allowed to bring their own fireworks (including sparklers). You should choose a large, clear and well mown area free from obstructions, well away from any buildings, trees and hazards like overhead cables, with as many safe entrances and exits as possible. These must be away from the firing area and dropping zone and at least 50m x 20m for your firing area. Beyond this you will need a dropping zone for spent fireworks of 100m x 50m in the downwind direction. Spectators should be kept back on the opposite side to the dropping zone at least 25m from the firing area. Bonfires need a lot of organising. Don't site it too near your display or firework storage area. And don't site it anywhere near fences or trees. Never use flammable liquids like paraffin or petrol to get it going, as this can result in uncontrolled spread of fire or explosion. Check immediately before lighting that there is no animal or a young child hidden inside. Don't burn dangerous rubbish (e.g. aerosols, paint tins or foam filled furniture). Remove any rubbish from your bonfire area in advance so nothing can be thrown onto the fire on the night.